ALL The Brand Names You Know & More! Creative Consulting takes pride that providing customized apparel and team wear was it’s humble beginnings. With over two decades of experience under our belts we consider ourselves experts in the wearable’s field. We have relationships with most every garment manufacture here in the US and Canada. With these relationships we are committed to providing our customers with the highest quality of products and decoration services to fulfill the needs for company apparel and team wear. We provide apparel for a variety of businesses, from university facilities employees & staff, to restaurant waiters, bartenders and management staff. We have a library of catalogs on hand and a sample showroom with a variety of brands, styles and colors. Amid the boom and growing desire to have an active lifestyle there are several brands that include styles that provide UV protection, moisture wicking technology and anti-microbial odor protection. Canvas Duck Outerwear, High Visibility Tee’s, Vests & Jackets, Bib Overalls & Coveralls, Work Shirts, Waterproof Garments, Work Gloves, Twill Pants, Work Shorts, Flame Resistant, Carhartt Footwear and a Full Line of Women’s Work Wear. We’ve got the goods! Whether you play on a weekly softball team and want performance tee’s screen printed, or you’re looking for a custom designed dye sublimated jersey’s for your men’s hockey league. When was the last time you were required to wear a dress shirt and tie to work? Looking for an item that’s a little more suitable for action than a cotton polo or tee? Jackets, Vests, Sweatshirts, Packables, Sweaters, Water Proof, Polar Fleece, Hoodies, Puffers, Softshell’s, 3 in 1’s, High Visibility, Pullover Crew Necks and 1/4 Zips! Want To Get Your Hands On Free Embroidery? New Customer Orders with a minimum purchase of 24 garments receive FREE set up and 48 garments or more receive FREE Set Up & Embroidery! Here's Your Embroidery Promo Code! Providing your employees with work wear for safety or weather related reasons is considered a benefit to the people that work for you. It not only lifts moral among employees it also increases brand awareness and helps to develop your corporate identity. Started in 1915 in the town of Berne Indiana as The Berne Overall & Shirt Company, Berne provided mid-western farmers with quality work wear that was durable and most importantly, affordable. Today, Berne Apparel provides durable high quality work wear & hunting apparel at a fair price. In 1889 Hamilton Carhartt & Company was founded by its namesake producing overalls with two sewing machines and a half-horsepower electric motor in a small Detroit loft. Today Carhartt provides Work Wear, Hi Vis Apparel, Footwear and Medical Scrubs worldwide. Since its beginnings in 1922, Williamson-Dickie Mfg. Co. has transformed itself from a small bib overall company to the largest work wear manufacturer in the world. Dickies now offers work garments ranging from jackets and coats, work pants and work shirts to denim jeans and women’s work wear. Creative Consulting Summer WORK WEAR SPECIAL! This months feature is hands down the best deal in town for a high quality moisture wicking High Visibility tee!! 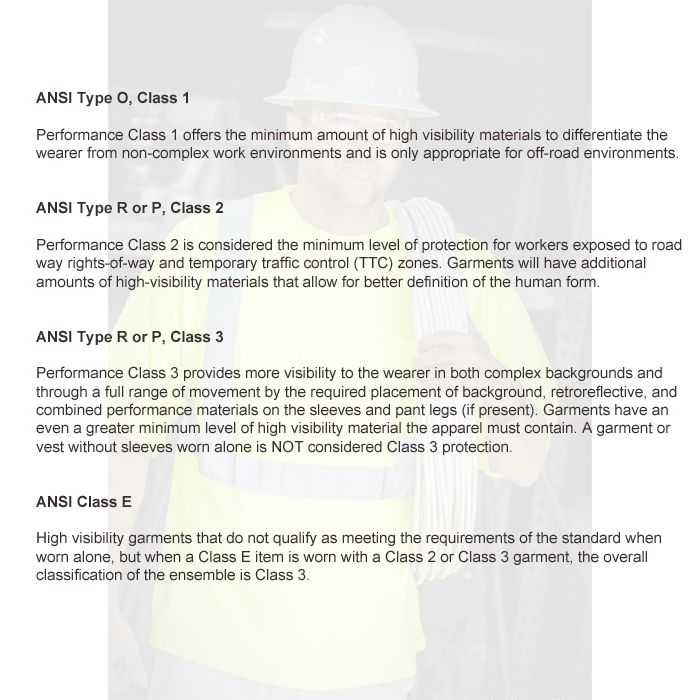 THIS MONTH’S SPECIAL is the Max Apparel Hi Vis Tee with reflective taping (Max 401 & 402) and their tee shirt without reflective taping the Max 400 & 422. Screen Printing is available on the front, back, and sleeves. 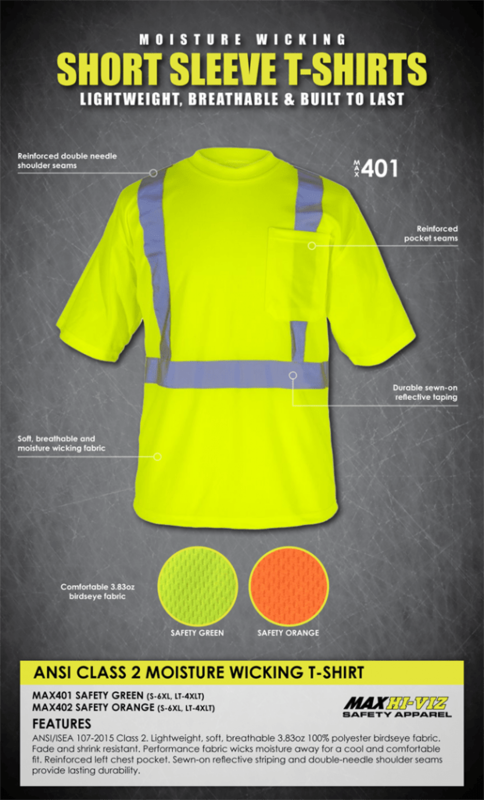 MAX Hi Vis Short Sleeve Tee Shirts. Meets ANSI/ISEA 107-2015 Class 2 Standards. Made of breathable 3.82oz, birdseye polyester and built to last. Easy care fade and shrink resistant. Moisture-wicking fabric promotes day-long comfort. Available Sizes S – 6XL, LT – 4XLT. New Customer Orders with a minimum purchase of 48 caps, hats or beanies receive FREE set up and 144 caps or more receive FREE Set Up & Embroidery up to 5k stitches! PROTECTING YOUR HEAD IS A GOOD THING! Fill out our form and let us know how we can help and we will be in touch with you promptly. There are so many cap manufactures and distributors there are too many to list. These are a few of our favorites! Look for closeouts & specials, discount offers and new product spotlights. Get Work Wear That Works As Hard As You Do! Whether you need a hard copy catalog, pricing or samples, let us know what you’re looking for and will be in touch with you promptly!